The Erebinae is an ecologically diverse, cosmopolitan group of moths which exhibit a number of remarkable predator defense adaptations. This subfamily is one of the most species-rich in the Erebidae, with estimates of up to 10,000 species, most of which occur in the tropics. 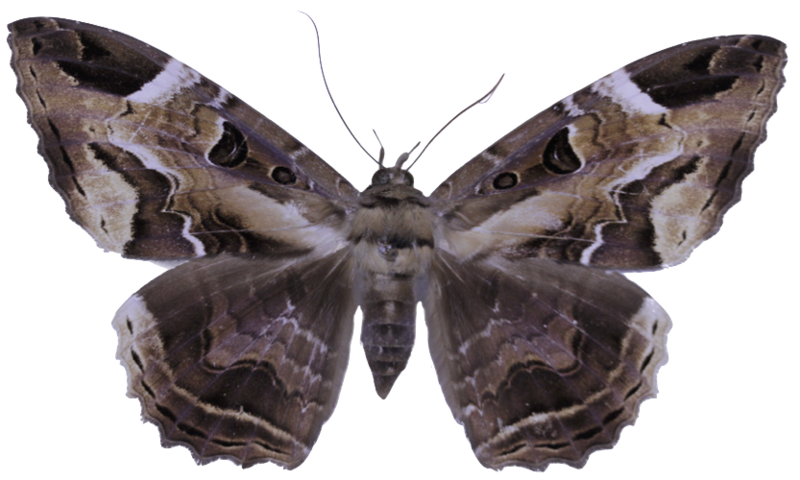 Adult moths run from small to very large, with wing spans range from under 2 cm to nearly 30 cm in the White Witch moth (Thysania agrippina). The caterpillars of Erebinae feed on a wide range of hostplants. Some lineages specialize in legumes and grasses, and a few species are pests of sugarcane and rice. Erebine moths also possess a range of adaptations for predator defense. They are thought to have some of the most sensitive hearing organs (tympana) of the Lepidoptera, allowing the moths to detect incoming bats and take evasive action. One species in New Guinea flies during the day and mimics a colorful wasp to ward off predators, but most are nocturnal and drably colored for camouflage. However, a number of these cryptically colored species possess bright, contrasting coloration which is concealed when the moth is at rest. The most classic example of this occurs in the Underwing moths (Catocala). When the moth is disturbed, this bright coloration is revealed. The sudden exposure of this coloration is thought to startle predatory birds, giving the moth a better chance of escape. Currently, the Erebinae fauna in most parts of the world cannot be identified accurately without expert assistance. Resources for identifications are limited, and many species can only be identified by reference to arcane original descriptions or a major museum collection. Furthermore, many Erebinae remain formally placed in a taxonomic framework that is over a century old, with extensive morphological homoplasy (distantly related moths that have a similar outward appearance) limiting the usefulness of morphological characters to Erebinae classification. Due to the lack of identification materials, the biology of most Erebine moths is not well understood. Our current definition of the Erebinae is based on the results of molecular studies by Zahiri et al. (2012), but the boundaries of the group remain in flux. There is no reliable external feature to diagnose all Erebinae, but many share a combination morphological features which are thought to be synapormorphies for the subfamily. These recent studies have made great strides in clarifying our understanding of relationships within the Erebinae. However, sampling remains sparse, and many genera still must be placed in the current phylogenetic framework.